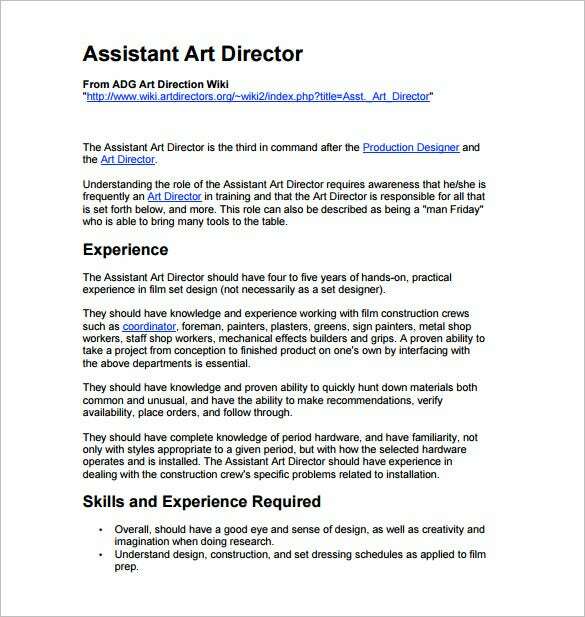 Art Director Job Description Template – 8+ Free Word, PDF Format Download! 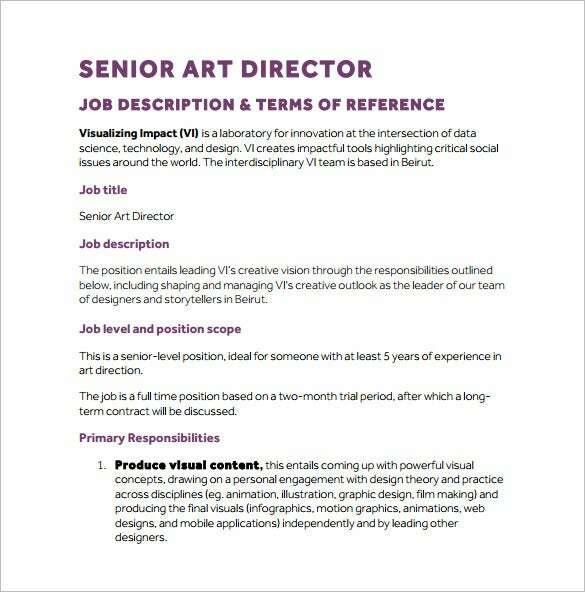 utvmedia.com | The Digital Art Director Job Description template offers a detailed description of all the roles and responsibilities that the selected candidate will be handling to manage the designated job profile. The prime motive of this template is to mention that the hired candidate will hold the responsibility for generating visual concepts as per the clients’ briefs. Additionally, there will be a mentioning of the required coverage of all media platforms, including digital communications, websites, mobile apps and more. 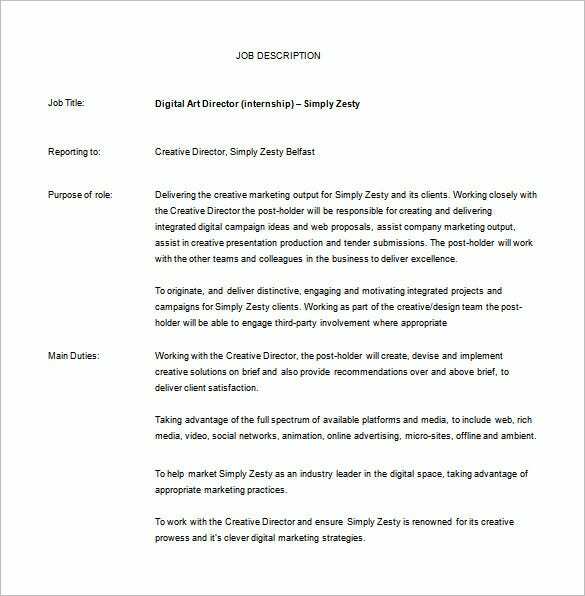 It also describes that the selected candidate will be managing marketing materials, press advertising, television and video, along with logos and branding to create a better image of the company. 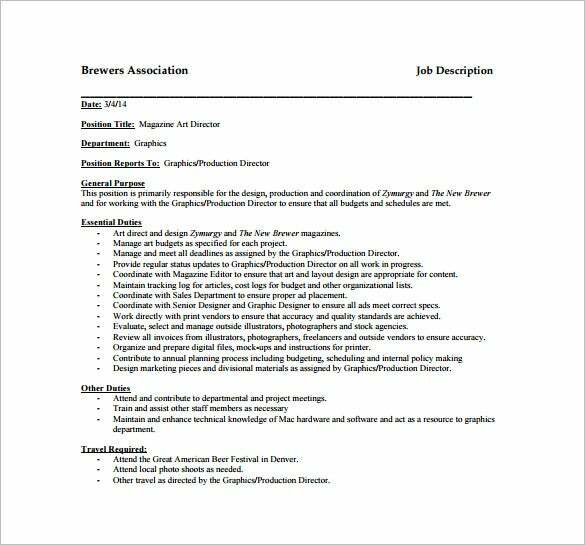 brewersassociation.org | The Magazine Art Director Job Description template is specially designed by experienced professionals and industrial experts to help you find the right candidate with ease. 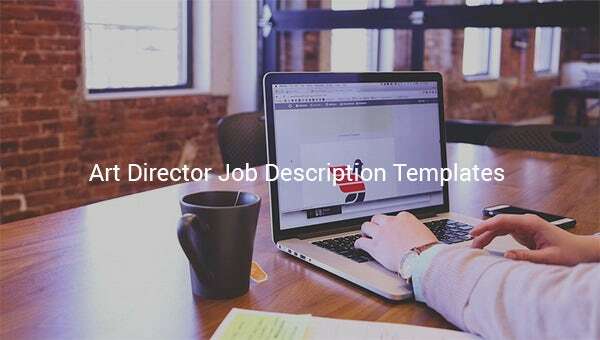 The template formulates basic layout design or presentation of the desired candidate profile and makes a final draft of all the requirements that needs to be fulfilled while applying for the mentioned job role. It carries a positive approach and specifies the material details to assure that all the job roles and responsibilities should stay clear in the minds of the employees who are appearing for the interview. 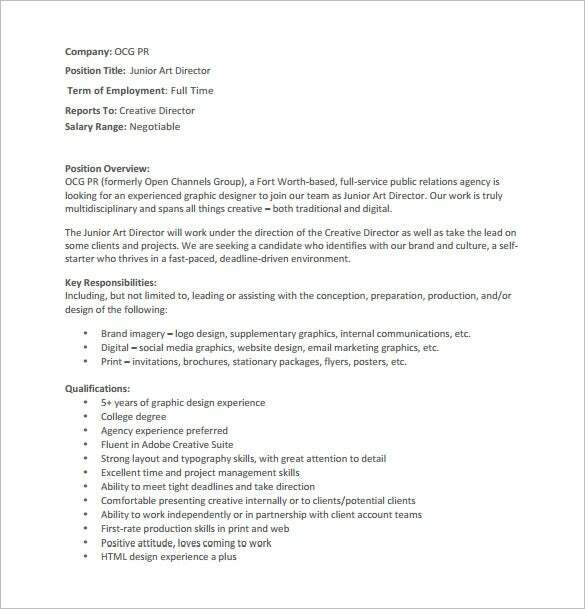 ocgpr.com | The Junior Art Director Job Description template offers a real feel of the advertising industry by listing all the necessary job roles and duties in a detailed manner. The template clearly mentions that the hired professional will be responsible for creating visual concepts as per the clients’ briefs and convey the same to the art director for final approvals. The template also provides a brief description of the entire hierarchy of the organization and provides details about to whom the selected candidate will be reporting to. 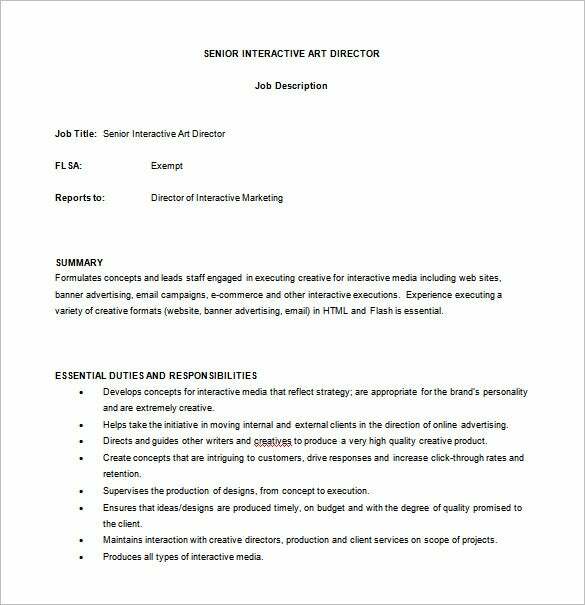 aaaa.org | The Senior Interactive Art Director Job Description template involves a lot of necessary pointers and things to remember that should be mentioned while hiring a candidate for a higher profile. A lot of research and study has been conducted while deciding the final framework of this template because the post requires a lot of experience and focused interactive knowledge to deal with bigger projects. It encourages the companies as well as the employees to portray great portfolio and fresh ideas for selecting the right candidate. 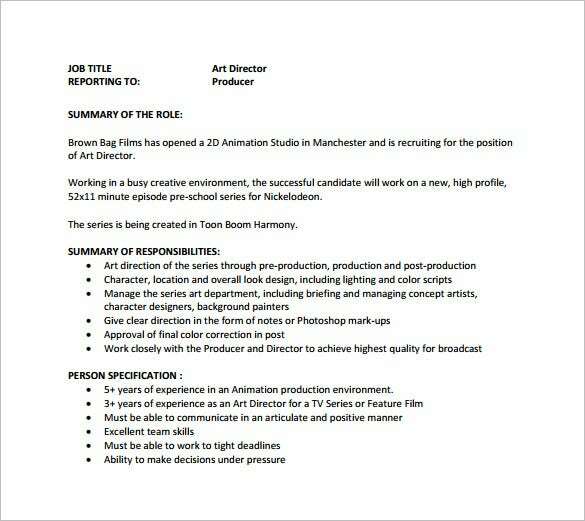 Since the selected candidate will be working with Creative Directors, Project Managers, Engineers and Copywriters, he/she need to have a sight on ideas that works for both the agency team and clients alike. Are Readymade Templates Sufficient Enough? They are available in various formats and versions to ensure easy, clear, and concise description of job roles for your company. They enable you to communicate job expectations, required educational qualities, and salary slabs with optimal clarity and preciseness to avoid future confusions. 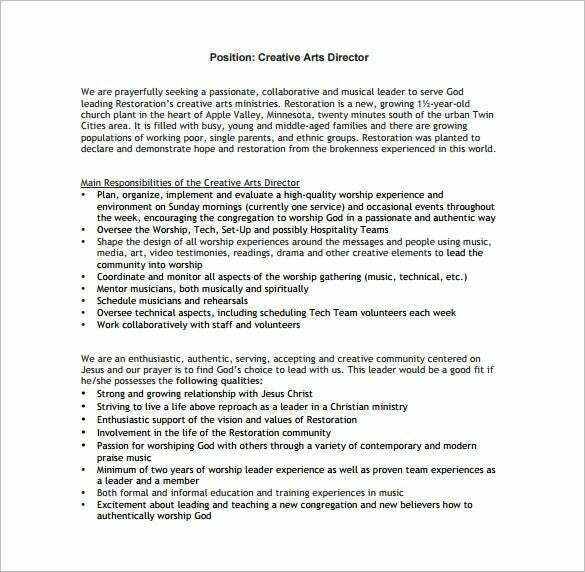 All of these templates encourage the belief that the candidate who is applying for the post should be a natural visual thinker and remain ready to learn from senior employees.